As you know I sent a letter to customer relations regarding my concern of the same color siding. They did respond, which is a good thing. The bad thing is... the response made no sense. Basically, I was told that as long as it wasn't the same model and elevation then it's not a problem. My neighbors signed their contract prior to me and their options were EXCLUDED from me (neither home next to me is a VERONA nor is it the same elevation). If their comments hold true, why couldn't I pick ANY color siding of my choice?? The house they are building across the street does not look like mine. That is not my complaint. My concern is, why are rules changing? Why was I short changed from picking the siding color of my choice if it's fair game for all (as long as it's not the same model and elevation)? Why are some homeowners treated one way and others another? Well it was confirmed that the house directly across the street from me has the same color siding (Graphite Gray). I have sent a nice letter to customer relations. I expect a response. Hopefully, they don't try to ignore me. I don't do well with people not addressing my concerns. OK, they are building a house across the street that appears to have the same siding (PISSED). If it's not the same color then it's only 1 shade off. Last time I checked, Ryan only carried one gray color siding when I was building. I went in the office Saturday to find out the rules. They are not supposed to build a house with the same siding directly next to or across the street from another house. The sales agent (new lady that I didn't work with) told me she was writing a contract and to leave a message on the answering machine. She will look into it. I left a message Sunday morning... it's Tuesday night and I haven't received a response (PISSED). I will reach out one more time before I submit an email directly to Ryan homes. This is not a playing matter and I will NOT be ignored!!! I had to push my inspection out until today. I thought they were just going to make a list and come back later. That's not the case, they are actually fixing items as we speak. So far...so good!! I know it's been a long time since you all heard from me. My 10 month inspection was scheduled for today. It was rescheduled due to the winter storm this week. I'm so glad that I was able to get out of the house today. I had cabin fever (been stuck in here since Tuesday). There are not too many things on my list for repairs. I will do one more scan of the house to ensure that I didn't miss anything. I'll let you all know how it goes. My PM came to the rescue. 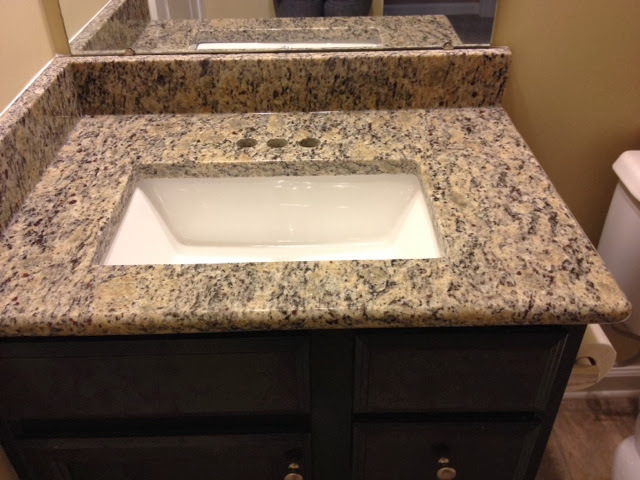 He sent the granite company that installed the kitchen out to look at my granite. They removed the stain and resealed it! Since they were out, I had them do the first floor bath. I also switched out the sink for a square one. LOVE IT!! Fixtures will get installed this weekend. I will post a finished picture after it's done! I know...it's been a long time. I have a bone to pick. I knew we had to seal the tile in the bathrooms but was never told to seal the granite in the bathroom. My granite has oil stains and that shouldn't happen if it was properly sealed. I'm hoping that I can get the stains out. I just ordered a product and will let you know. Glad I only had Ryan install granite in one bathroom. I will have Metro Stone & Granite (company that installed kitchen granite) put Santa Cecelia in the first floor bathroom. I like the thickness of the kitchen granite vs. the bathroom granite. It's lower on the priority list but will definitely be done.